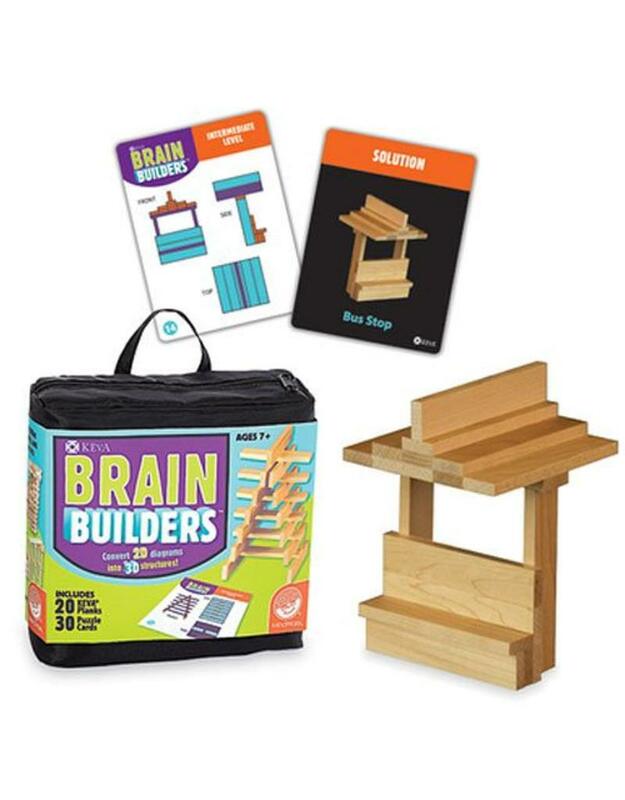 Brain Builders combines 20 KEVA planks with a set of double-sided puzzle cards. Each stimulating card features a 2-D challenge on one side and its solution on the other. The goal is to recreate 2-D patterns into 3-D structures. The 2-D cards show the design from different angles highlighting the front, side and overhead view and increase in difficulty from beginner to expert. Manipulate your KEVA planks to successfully duplicate the balance, proportion, composition and geometry featured on each card. Once you think you've solved the blueprint, flip it over to check the solution—try to resist the urge to peek! As each build becomes more challenging, patience and confidence is gained through trial and error. From picnic tables and rowboats to swans and snails, you will be amazed what your brain will build! Time to put your 3-D imagination to the test!